We now come to a long awaited book by A. N. Matveev. Sometime back we had seen his Mechanics and Theory of Relativity. In this post we will see Electricity and Magnetism. This book is a part of 5 book course by A. N. Matveev. This course reflects the present level of advancement in science and takes into account the changes in the general physics curriculum. This course mainly aims at the description of the experimental substantiation of the theory of electromagnetism and the formulation of the theory in the local form, i.e. in the form of relations between physical quantities at the same point in space and time. In most cases, these relations are expressed in the form of differential equations. However, it is not the differential form but the local nature which is important. Consequently, the end product of the course are Maxwell ‘s equations obtained as a result of generalization and mathematical formulation of experimentally established regularities. Consequently, the analysis is mainly based on induction. This, however, does not exclude the application of the deductive method but rather presumes the combination of the two methods of analysis in accordance with the principles of scientific perception of physical laws. The book was translated from the Russian by Ram Wadhwa and Natalia Deineko. The book was first published by Mir Publishers in 1986. Many thanks to Vikram V. for making this book available. Note: Original cover was not available in hi-res, so I made a new one. Also, unlike many other of Matveev books in this series (for example in Optics) this version of the book does not have “coloured text headings”, it might be possible some other version of this book has them. We will see Optics by Matveev sometime in future as I have a physical copy. The other two remaining volumes, namely Molecular Physics and Atomic Physics (even rarer, as supposedly only ~ 300 copies were printed in English) are as elusive as they get. If anyone has access to these please give a life back to these books. This entry was posted in books, mathematics, mir books, mir publishers, physics, science and tagged ampere's law, bio-savart law, conductivity, coulomb's law, dielectrics, direct current, electric charge, electricity, electromagnetic field, electromagnetic induction, electromagnetic waves, electromagnetism, electrostatic field, invariance, kirchoff's laws, magnetics, magnetism, matveev, maxwells's equations, noise, quasi stationary, Quasistationary Electromagnetic Field, wave guides. Bookmark the permalink. Dear damitr I’d like to share a with you a good way to download djvu files (instead of pdf) from archive.org ::(For Google Chrome) For a link like https://archive.org/details/MatveevElectricityAndMagnetism 1. Right click on DJVU file hyperlink &select “Open in new tab” 2. Quickly hover to that tab & stop loading that page (otherwise u’d open the djvu applet) 3. 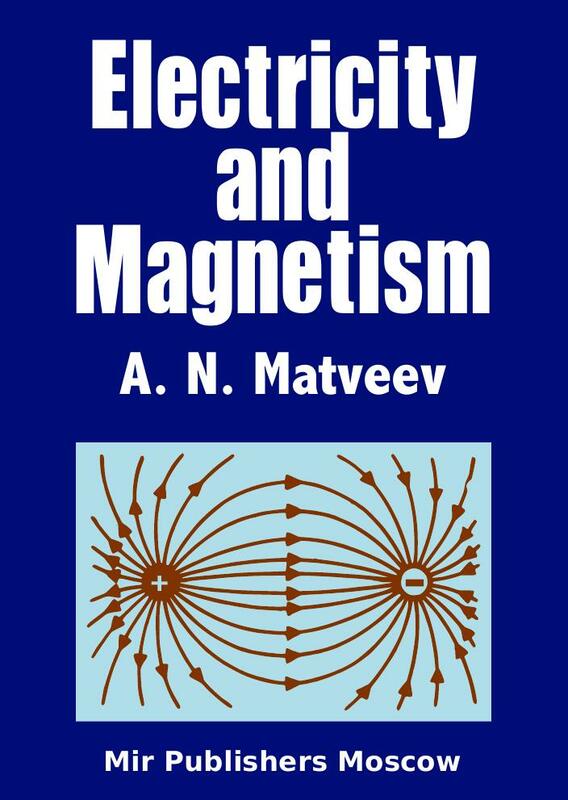 Now u’d have a link as https://archive.org/stream/MatveevElectricityAndMagnetism/Matveev-Electricity-and-Magnetism.djvu 4. Simply replace “stream” with “download” & press enter. I hope this’d be helpful. I’m a student in senior highchool year & have benefitted a lot from ur uploads. Thanks a lot ;keep going. To get direct link for all files on Internet Archive, click on All Files: HTTPS link on the page. You can find it just below the DJVU link on the page. Clicking on this would give you all possible formats for downloads, including the scans of the pages as separate images. I think you’re doing a great work preserving these excellent works of soviet science for the future. When an empire collapses, no matter how lucky it is that it does, it’s always a pity of the cultural achievements to go down with it. On a more concrete tone: do you happen to have a file of Quantum mechanics, by Sokolov, Ternov and Zhukovskii, published in 1988 by MIR? Yes, Sokolov’s book is already there. Till we make a post about it here on MirTitles, you can get the book on the Internet Archive. Thanks to OU for the scan. I’m afraid that’s an older book, by Sokolov, Loskutov and Ternov, from 1966. But I am not 100% sure. Okay. This I did not check. But I do have Sokolov in hard copy, so we may see it in future. I’d be very happy if you could do it. Thanks in advance. Thank you so much for you effort, it cannot be put in words how good of a thing you’re doing uploading these books. I wanted to ask you if there is a chance for Matveev’s Optics to be uploaded in the recent future. Believe me, an entire generation of physics student would be very grateful to you, I know it since me and all of my colleagues are trying to find it. Anyway, thank you once again, and keep up the tremendous work that you’re doing! Thanks for the kind words Jovan. Yes you will definitely see Optics, but it will take some time as I am super busy with my dissertation right now. Perhaps sometime in late summer you will see that wonderful volume. i’m truly grateful and i wanted to thank you so much for all of your work, those books are so beatiful that it would be a shame just to forget them. We don’t want library of alexandria vol2 !! I’m currently studyng from Irodov (i bought a physical book) and integrating from this beatiful book of Matveev. But I can’t find anyware a copy of optics from matveev, it would be so nice if you could upload it! Hi MIR! An excellent job. Many Thanks. U want Optics and Atomic Physics by A. N Matveev (in English version) in Archive. Do you have them? If yes, please post a link, we all will be greatful! Can you scan on of them? It is a mistake. I want to say “I want Optics and Atomic Physics by A N Matveev…”, I have no, but if u have. kindly upload in archive. I want OPTICS and ATOMIC PHYSICS be A N MATVEEV. Kindly help me to find out download link. I request you to upload optics by matveev. please let me know if you plans to do it any time soon. Please upload Optics by A.N. Matveev. It would be very helpful. Please upload “Optics” by Matveev. It will be very helpful. Please. What is the author name?